There are several additional Files layouts in this section. Some layouts, those "with download Button", have an individual download button, others have "with Checkboxes" have a checkbox that allows selecting multiple downloads. Of couse the download button or checkbox only appears when the user has permission to download. Compact layouts - here the details are in a more compact form than those in the standard layouts. With 'readmore' button. These do not show the details but have a 'Readmore' button that leads directly to the 'Download Details' view. More 'Inline' layouts designed for use in Articles and other content. This layout gives a more compact view of the 'details' than those shown by 'Standard Files Layout without Checkboxes v3.2'. This Layout works for all jDownloads menu items. Click on the image opposite to see an example of this layout. This example has description, an image and a video preview, all of which are optional. The 'Compact Files Layout with checkboxes v3.2' is very similar to layout 'Compact Files Layout without checkboxes v3.2' except of course each Download has an individual tickbox to allow multiple Download selection. Layouts with checkboxes do not work when using a 'List all Downloads' type menu item. Click on the image opposite to see an example. Note in this example none of the optional description, images or preview items have been added. This layout shows the usual 'title' line including a Download button, Tags and a 'Readmore' button which will take the user directlyto the current Download Details page. Note if the user views the download details then they can also download ther individual file from there. This Layout works for all jDownloads menu items. Click on the image opposite to see an example of this layout. It does not show any description, any images any previews. These are of course available in the Download Details view when activated by the 'Readmore' button. 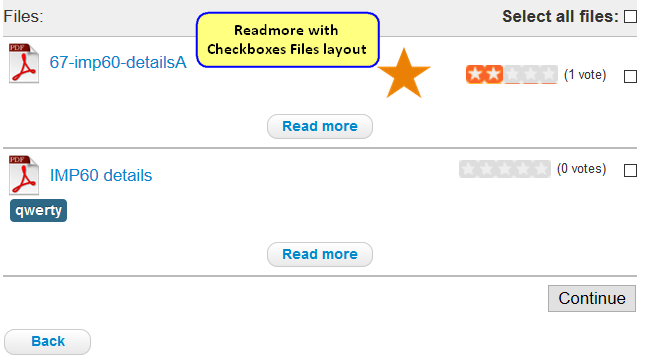 This layout shows the usual 'title' line including a check box, Tags and a 'Readmore' button which will take the user directlyto the current Download Details page. Note if the user views the download details then they can also download ther individual file from there or return back to use the check boxes to select multiple files. This Layout works for all jDownloads menu items. An "inline" layout suitable for use in content. This version shows an icon as well as the download link. See image for various examples. For more information on using the Content plugin please see the link below which opens in a new tab. An "inline" layout suitable for use in content. This version shows an icon representing the type of file and, if applicable, the featured star as well as the download link. See image for various examples. An "inline" layout suitable for use in content. This version shows an icon representing the type of file and the name of the containing Category as well as the download link. See image for various examples.